But since interest rate swaps are now estimated to be a 700 trillion dollar market, I doubt if a housing bubble can sustain losses in the swaps. The chart in this article about austerity shows exactly where the crisis occurred when the losses in swaps started. Those losses threatened the entire banking system. In the days of a strong middle class, the derivatives did not exist. The banks made loans to people in the real society based on sound underwriting. They speculated on commodities less. They allowed the middle class to prosper. 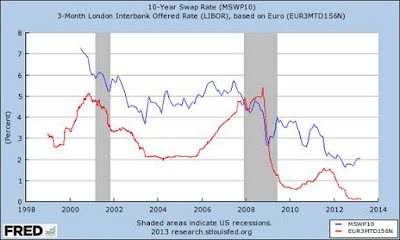 Now banks want to force companies to take interest rate swaps, as I wrote on Seeking Alpha. This creates demand for treasury bonds, which keeps interest rates low. That business, being forced upon companies by the TBTF predatory banks, is not likely to go away anytime soon. Perhaps Thatcher, in her libertarian zeal, didn't see that coming. But surely she understood that regulation happened because the banks did bad things in the Roaring Twenties leading up to the Great Depression. She knew that this deregulation would cause bad things. Derivatives are very bad things. In 1982, Congress passed the Alternative Mortgage Transactions Parity Act (AMTPA), which allowed non-federally chartered housing creditors to write adjustable-rate mortgages. This bi-partisan legislation was, according to the Urban Institute, intended to "increase the volume of loan products that reduced the up-front costs to borrowers in order to make homeownership more affordable." Among the new mortgage loan types created and gaining in popularity in the early 1980s were adjustable-rate, option adjustable-rate, balloon-payment and interest-only mortgages. Subsequent widespread abuses of predatory lending occurred with the use of adjustable-rate mortgages. Approximately 90% of subprime mortgages issued in 2006 were adjustable-rate mortgages. This was Ronald Reagan's answer to Thatcherism, and Reagan was influenced by Thatcher who got her marching papers from the Square Mile, which I view as being the very seat of modern banking oppression, ie, the new world financial order. Reagan established the deregulation for the future housing bubble in 1982, and he was the cause of the bubble here. But Thatcherism was the foundation for this Reaganism. The banks had the ears of these two politicians who were tied at the hip. The adjustable rate versus fixed rate dilemma, which lead to interest rate swaps and toxic home mortgages has been in the works for some time. And as I said, there was no Glass-Steagall in the UK to stop this from going on there. To make easy money really easy took the repeal of Glass-Steagall here and the establishment of derivatives swaps, both interest rate and mbs, that put the financial system on the brink. We had liar loans thanks to Reagan. The UK had self certified loans, which is a nice way of saying liar loans, there, thanks to Thatcher. The regulations that came out of the Great Depression that limited commodity speculation, easy loans, contagion between banks with bad collateral on their books, and that forced derivatives regulation, were good rules. They were necessary rules. Now look at what has happened precisely because these rules were brushed aside so that the phony invisible hand of selfishness and of libertarian greed could do its dirty work. Thatcherism was a libertarian movement. They worship the woman. But she oppressed everyone else, and Will Rogers warned about people like her. He warned about loans with a dollar down. Will Rogers warned that everyone should look around at the guy who has the fanciest house. He is the banker. Rogers warned that freedom from bankers can only happen by not accepting their easy terms. That part of Rogers' legacy has been subdued by the main stream media on purpose, so that the bankers could take advantage once again. 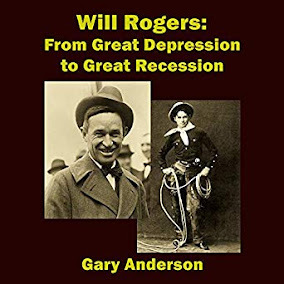 Will Rogers was the most popular man in America, and with FDR, taught the greatest generation a lesson with regard to bankers, avoid their loans, and especially easy terms, at all cost. So, Margaret Thatcher died today. I am not sorry.